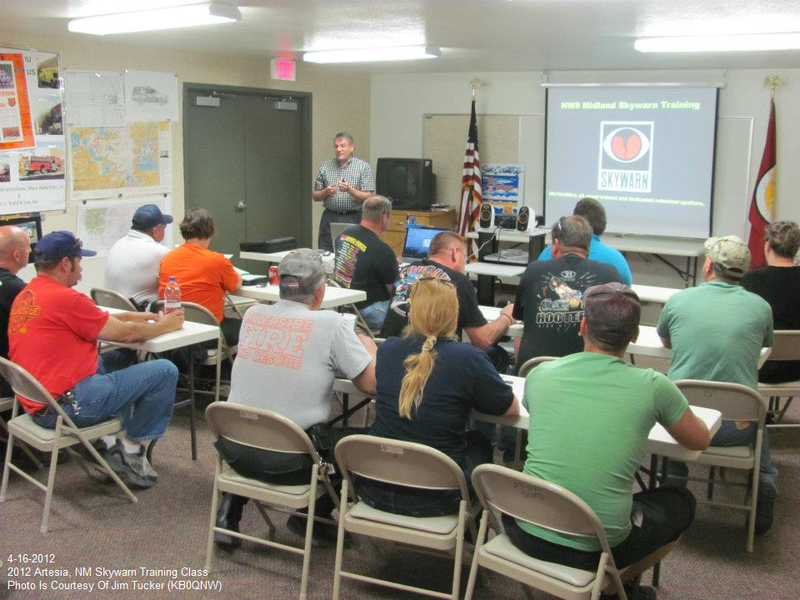 2012 Eddy County NM Skywarn Spotter Training Completed. 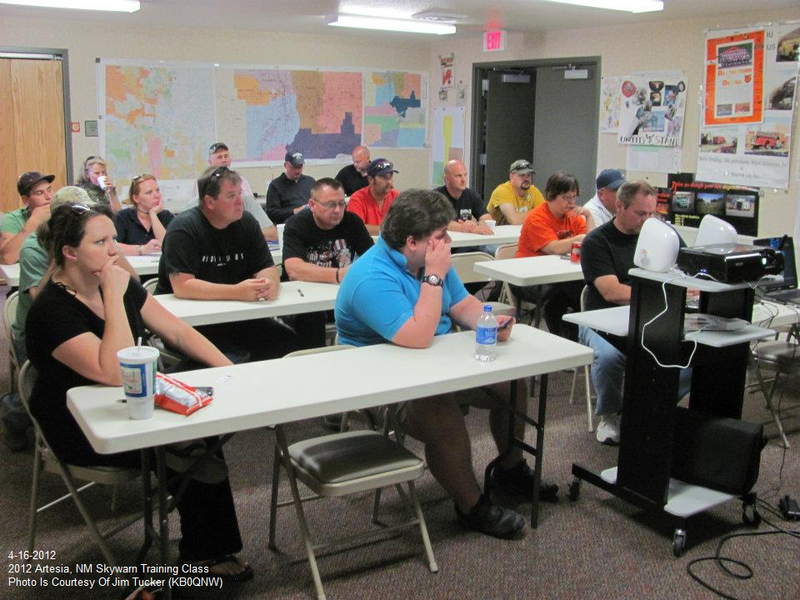 2012 Skywarn Spotter Training Class. Each spring the Midland National Weather Service Office, the Eddy County Emergency Management Office, and the Eddy County Skywarn Spotter Group, participate in our annual Skywarn Spotter Training Classes here in Eddy County. Pat Vesper, who is the Warning Coordination Meteorologist at the Midland National Weather Service Office, hosts these meetings, along with Joel Arnwine, the Eddy County Emergency Manager. I would like to thank Pat, and Midland National Weather Service Office for their continued support of our local Skywarn Program. Pat is a great instructor and always puts on a very informative meeting. I would also like to thank Joel, and the Eddy County Emergency Management Office for their continued support and backing of the Eddy County Skywarn Spotter Program. Joel is directly responsible for getting our current group of Skywarn Amateur Radio Spotters trained and certified, along with the five new amateur radio repeaters recently installed around Eddy County. We never could never have accomplished this without his help and support. Eddy County is very fortunate to have an Emergency Manager who is as dedicated to our Skywarn Program and its success as Joel is. 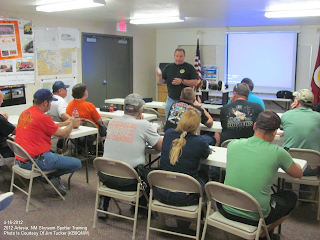 We appreciate the Sun Country Volunteer Fire Department, and Norbert McCall their Volunteer Fire Chief, for allowing us to have our Artesia meeting in their training class room. We also appreciate the Permian Basis Regional Fire Training Center, and Traci Arnwine, their Director, for allowing us to have our Carlsbad meeting in their training class room. 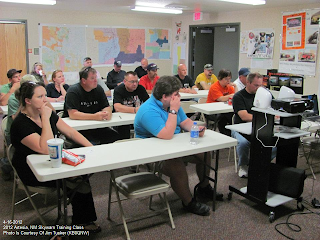 To date, (since the spring of 2005) Eddy County has about 160 Skywarn Storm Spotters that have been trained in these meetings, and are active in the program as storm spotters. Roughly 60 of these volunteers are amateur radio operators. These 160 members of the Eddy County Skywarn Spotter Group are our local citizens who volunteer their time to observe severe weather which includes, severe thunderstorms, wall clouds, funnel clouds, tornadoes, heavy rainfall, and flash flooding. They report their observations directly to the Midland National Weather Service Office during severe weather outbreaks. They are without a doubt our first line of defense for our communities during severe weather outbreaks here in southeastern New Mexico. A good number of them, including our amateur radio operator spotters, are mobile, and travel up and down Eddy County spotting severe weather. They provide ground truth information directly to the National Weather Service Forecasters. Their spotter reports which combined with the National Weather Service Doppler Radar information, Satellite data, and other information, paint a true picture of what a severe thunderstorm is, or may not be doing here in Eddy County. Many times their reports help to trigger a severe thunderstorm warning, tornado warning, or flash flood warning for Eddy County. We are also fortunate here in Eddy County to have members of the Eddy County Sheriffs Department, our local Volunteer Fire Departments, our local city Police Departments and Fire Departments, also serving as active Skywarn Storm Spotters. We greatly appreciate the support of these agencies in our local Skywarn Program. Thank you for your time and spotter reports. On behalf of Joel Arnwine and Pat Vesper, I would like to thank each and every Skywarn Storm Spotter who has actively participated in our local program over the past ten years. We greatly appreciate your time, and spotter reports. I am proud to be your Skywarn Coordinator. Your severe weather reports have been invaluable over the years and Eddy County is lucky to have you. Thank you for a job well done, stay safe this year, and good luck with your spotting and storm chasing endeavors.